Italians Love Coffee and Sweets for Breakfast! News break: if you’re Italian, you can have cookies for breakfast. Seriously, cake is a traditional breakfast food in Italy and so are other sweets including cookies, brioche, pastries, croissants,etc. Coffee is consumed as well and it’s usually a quick espresso or a cappuccino (please don’t order a cappuccino after 10:00 AM in Italy or just after your dinner, you’ll be officially deported). If you’re consuming your breakfast at home then you’ll most likely make espresso via a stove top machine and add a bit of milk for a cafe latte and maybe eat a cookie or two before heading out the door. 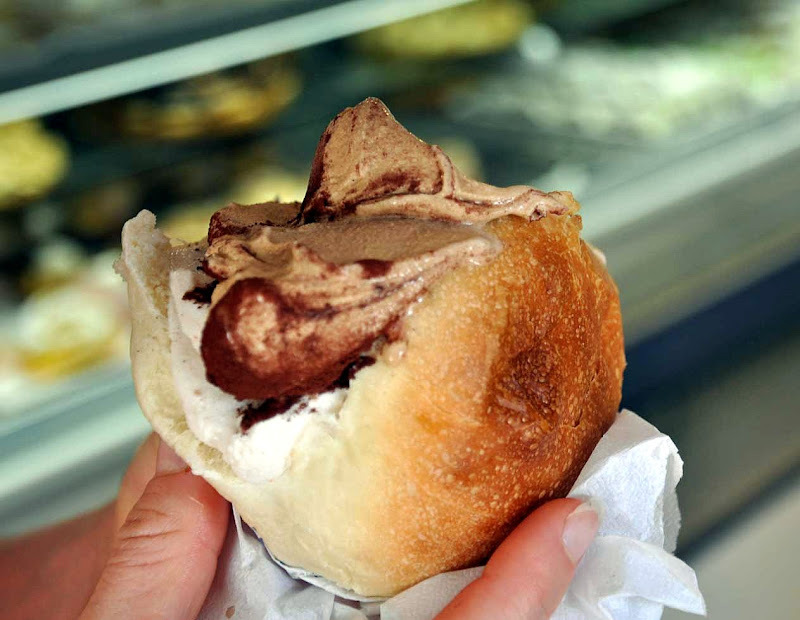 In parts of Calabria and Sicilia, and one of my favorite breakfast combinations when I’m in Italy, is a brioche stuffed with a scoop of gelato, followed, of course, by an espresso (ristretto style!). Rest assured you’ll feel great after consuming this breakfast, only to feel hungry and devoid of energy 30 minutes later (I suppose this is why every office in Italy has an automatic espresso machine). Here in the United States (like many Anglo Saxon cultures) breakfast is a hearty affair, including cereals, eggs, ham or bacon, bread, etc. And I truly enjoy the traditional American breakfast more than the Italian kind; I often start the day with coffee (either a cup from my trusty French Press or a stove top espresso with milk) followed by a poached egg with whole wheat toast, a bowl of fiber rich cereal with milk, or, during the winter months, oatmeal made with milk (including honey or maple syrup and either some banana or raisins). Specifically, I’ve come to enjoy oatmeal (partly due to my wife who grew up eating it) only after coming to grips with the premise that only horses should consume oats. Now, I enjoy oatmeal because it keeps me full until lunch time and includes tons of nutrients if you consumed in the right manner (see below). One of our devoted readers, Dr. K. (a dermatologist by training and a “from scratch” food expert) recently provided his version of homemade oatmeal for breakfast and I thought I would share it with everyone. Enjoy! With winter being well underway here in the Northeast, starting your day with a warm and hearty breakfast helps one cope with those cold, blustery days. The food industry, through mass marketing, has spent a lot of money trying to convince us that the only answer is an overpriced packet of instant oatmeal or other processed hot cereal. But you can do better from a nutritional and taste standpoint, and save money by eating whole grains in a more natural and wholesome form. A bowl of hot cereal can be a delicious and nutritious way to warm you up in the morning and include whole grains in your diet, with their innumerable health benefits. But it helps to get a little creative with your breakfast choices so that you don’t get stuck in the monotonous routine of eating the same boring porridge every morning. Steel cut oats find their way onto our table at least once a week. These are whole, hulled oat groats chopped into two or three pieces by industrial machines (you can’t reproduce this at home with your food processor or blender). Some people like to prepare these with an overnight water soak, and/or a long slow simmer up to 45 minutes, but this can be a bit tricky if you’ve got to get to work in the morning. It also tends to produce a softer, mushier texture that in my opinion isn’t worth the extra effort. I prepare these simply and easily by bringing adding the steel cut oats to a pot on your stove containing twice the volume of water as oats and a small amount of sea salt. Turn the heat up to high and stir constantly until boiling, usually just a couple of minutes depending on the quantity you’re preparing (for my family of 2 adults and 2 children, 1 1/2 cups of steel cut oats does the trick). Once it’s at a boil, turn the heat way down, cover the pot, and simmer for 10-12 minutes. They’re ready to serve, and have a nutty taste and toothsome consistency that is far different than your typical bowl of oatmeal. I like to serve these with cinnamon, nutmeg, dried figs, chopped walnuts, and a drizzle of honey. Add a little milk or buttermilk (homemade if you have it) before serving. You can purchase steel cut oats in boxes or tins at the grocery store, but they can cost up to $8 a pound with unnecessary packaging. Find a grocery store, cooperative buying club, or health food store where you can obtain these in bulk (you can buy these online in bulk as well) for less than $1.50 a pound and you can buy enough to last for months. Rolled oats are another tasty and healthy option. But commercially rolled oats are thin and make for a mushy boal of oatmeal. And many nutrtional experts state that the process of heating/steaming and pressing the oats begins a process whereby many of the nutrients are lost or degraded within 72 hours. You aren’t getting the full benefit of the whole grain by the time it makes it to your store or your breakfast table. So I no longer buy commercially rolled oats. I purchase bulk whole hulled oat groats and roll them in a flaker mill the morning I will be cooking them. I use the Family Flaker Mill attachment for my Bosch Universal Plus Mixer (which is like a stand mixer on steroids, with enough torque to knead 15 pounds of dough at a time for some serious breadmaking). I can flake the oats in just a couple of minutes while bringing the water to a boil. Or let my daughter do it while I attend to other tasks! The taste and texture of these freshly rolled, thick oats will put any store-bought rolled oats to shame. For our family of four, I add 2 cups of rolled oats to 3 1/2 cups of boiling water with a little (~ 1/2 tsp) salt (optional). For an extra flavor kick, substitute a cup or more of the water with an equal amount of whey (leftover from home cheesemaking). Serve with milk or butter, local honey or maple syrup, your choice of chopped nuts, and chopped dried (figs, dates, apricots are nice) or fresh fruits (apples mostly this time of year). The flaker mill can flake more than just oat groats. Try flaking whole rye berries, by themselves or mixed in with rolled oats (they can all be flaked together, which is what produced this creamy and delightful bowl of hot oats and rye with chopped Asian pears and walnuts seen in the photo). You can (and should) add a lot of variety to your breakfast menu by flaking a variety of different grains, such as soft or hard wheat, spelt, and kamut. Flaking some of the harder grains like Kamut produces a creamy, farina-type cereal that gives a completely different mouthfeel from steel cut or rolled oats. If you don’t have a Bosch Universal Mixer (which I highly recommend for a number of uses), you can purchase a hand-cranked flaker mill which does the same thing. inations are limitless and up to your fancy and individual tastes. You can also have a number of exciting and nutritious breakfasts just by cooking the whole grains themselves. Whole oat groats, buckwheat groats, millet (look like corn grits but healthier– great with chopped bacon, onion, and grated cheese), quinoa, and farro can make fantastic hot breakfasts. The whole grains may take longer to cook so you’ll have to budget some more time into your morning, but many of these can simmer while you’re getting ready for work in the morning. There’s not a lot of active prep time with these whole grains. So please don’t waste your money on flavorless (usually compensated for by manufacturers with countless additives, artificial flavors, and sweeteners) and nutritionally devoid instant hot cereals. Enjoy healthful and delectable whole grains, and you’ll find yourself looking forward to those dark, cold winter mornings rather than dreading them! I never noticed my Calabrese grandparents having anything for breakfast besides coffee, except on Easter. Then, after Mass, my grandmother put out fiery hot Calabrese fried sausage with chunks of homemade bread. My grandfather added shots of whiskey. The kids big enough to hold a glass got a shot of anisette. When I stayed with them alone and asked for cereal, I was presented with a bowl of torn up day-old bread covered with warm, sweet, milky (evaporated milk. They kept no fresh milk) coffee. Today I make Meusli with four grains, rich with raisins, currants, dates, and almonds. This is generally served with lots of fruit and yogurt, but when I want porridge, I just add milk and water and cook up the meusli. That’s four days a week. The other three days is a modest English breakfast; bacon or sausage, toast, and a soft-boiled egg. Nice recipes – and advice. My standard breakfast is a cut-up hard fruit, like an apple or pear (with an occasional banana), along with a generous handful of walnuts (10-15 walnut halves), added to low-fat yogurt or kefir. When I cook oatmeal, I use the microwave – ratio of 2 cups water to one cup rolled oats; I don’t have a food mill so I buy store-bought bulk, thick flake (organic, if available) oatmeal. Steel cut oats are great, too. I’m going to try some of these recipes!